It’s that time of the year again! 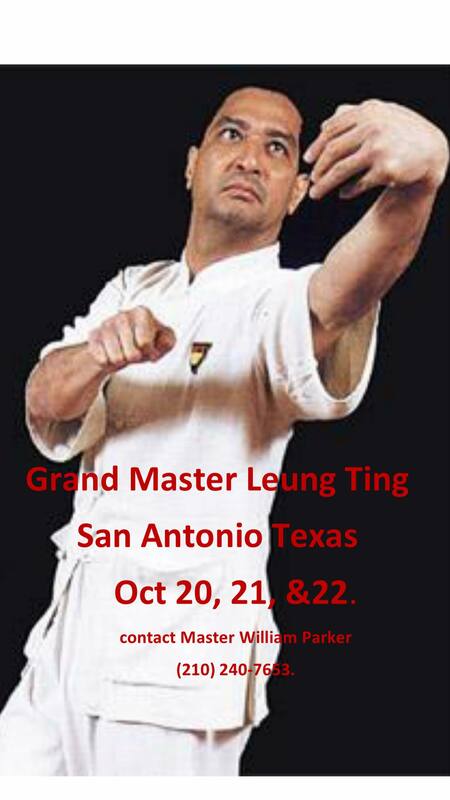 It’s time for Great Grandmaster Leung Ting to come over to Texas and train the North American Section of the IWTA, from October 20-22, 2017. All IWTA-NAS members wanting to learn from the source of Leung Ting WingTsun® should come! While the Friday class is reserved for only those Student Grade 10 and above, Saturday and Sunday are open for all current students and instructors! Anyone wanting to attend should contact Master Will Parker, who is sponsoring the seminar, as he can answer questions about the area as well. Each day will be 4 hours of training with a lunch break to divide it into two separate 2 hour sessions. Instructors, please try to send in one check for everyone from your branch who is attending and please include a list of students attending with their IWTA-NAS membership numbers and the dates they will be attending. For those who need to register individually, please print your IWTA-NAS membership number on your check and include information on which dates you will be attending.